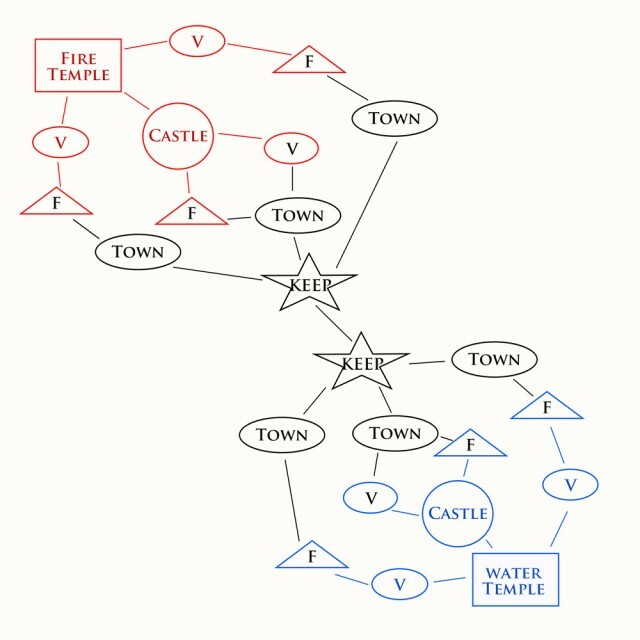 Eternal War Strategies with Diagrams! The new season of Eternal War will start on Dec. 13! Many warriors may still be confused about the rules. 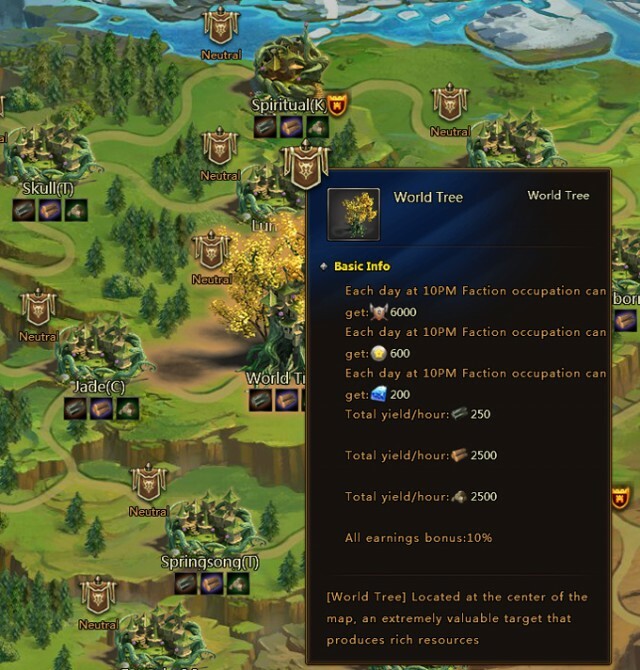 Below are some important things you should know for the first day of Eternal War, read on and be enlightened! ※ To make it easier to understand, only the Fire and Water Factions are included in the diagrams. Strongholds are simplified as well. ※ Red is Fire and Blue is Water. Black represents Neutral territories. ※ As is known to most, Legions can earn resources from captured territories to build powerful Weapons. Besides the Temple of Elements (spawn point), and the adjacent Castle and Villages belonging to your Faction, all of the other Strongholds are Neutral. Players need to defeat NPC Defenders to capture these Neutral places. The Castle and 2 Villages yield rich resources and belong to your Faction automatically after 10:00AM. 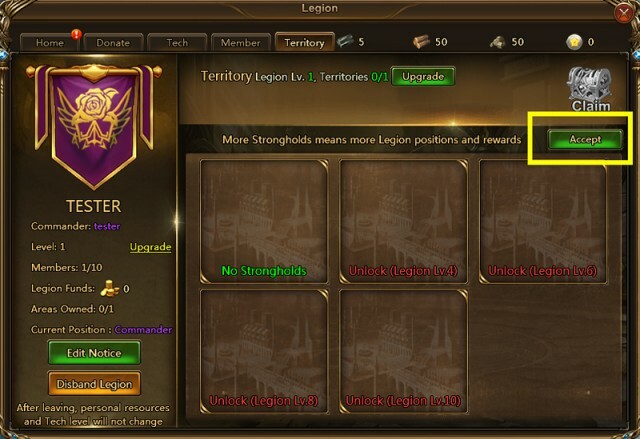 Players should open the Legion panel and stay in the Territory tab in advance, and click on “Accept Stronghold” on 10:00AM to win the 3 territories! 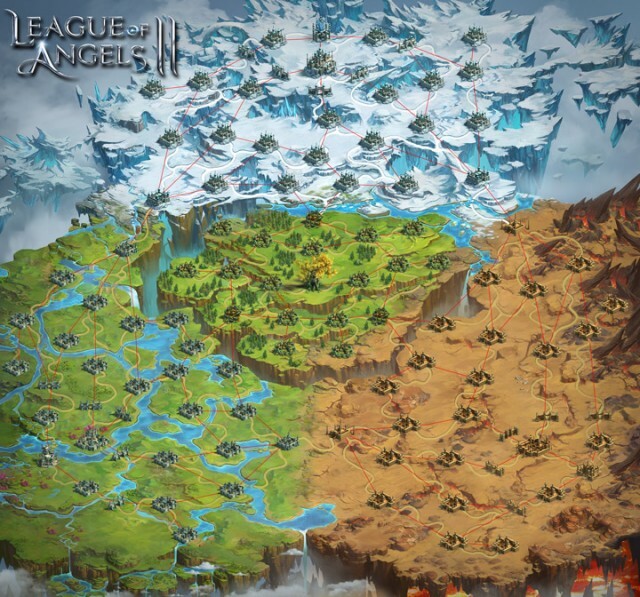 As you can see in the picture, before 8:30PM the first day, players can only capture Villages and Forts of their Faction, but not other Factions. The 10.5 hours from 10:00AM to 8:30PM is also a great time for Legions to capture Territories and collect resources. Building Weapons with resources faster than your enemies and sweep away all your opponents in big battles at night! ※Please note: Don’t rush to use Weapons to fight NPC defenders, save them for battles at night against other players! 4. From 8:30PM to 10:00PM, now the serious battles begin! Players can now attack all Strongholds! After nailing down the NPC Defenders in Towns and Keeps of your own Faction, you can set off and attack enemies’ Strongholds! ※Before attacking, the Commander or Officers must place a Divine Seal. Don’t forget it! 5. In the picture below, a Keep and a Town of the Water Faction have been taken over by Fire. If Water does not take them back before 10:00PM, what will happen next? 6. Answer: From 10:00AM the next day, Fire Faction can attack the adjacent Village and Fort from the Strongholds they captured. As is shown in the picture below, the places with ★ are in danger. Water Faction should try their best to defend, or their Castle may be captured after 8:30PM! How to capture Neutral Villages? Once inside a Village, players should attack Barracks NPC Defenders first, then bypass Gate NPC Defenders and attack the Elite NPC Defenders. The Village will belong to the Legion who killed the last Elite NPC Defender. Finally, different Strongholds yield different resources! Hover over the Strongholds to see more details. That concludes this indepth strategy guide to the Eternal War. If you have any special tactics, please share with in the forum! We wish you glorious victory in the Eternal War!